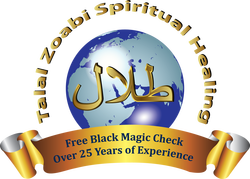 Click here to read some of Talal's clients Testimonies. You are not alone, this happens to more people than you think. People are overcoming this all the time and you can too! I am proud to announce that my internet site is finally up and running! Thanks for visiting. As a result of high demand, I have created this website for all of my clientele worldwide. This will offer you easier access to contacting me, my services, advice, and products. Take a look around and learn more about my life by clicking on About Talal. On my website you'll see a list of my famous services, explanations for confusing questions about breaking sorcery spells, haunted homes, possession and supernaturalism. Throughout the method of making my website, I researched the web and examine if there are different services like mine on the market. During this search, I stumbled on lots of inaccurate info. The sites that I viewed were claiming to breaking black magic spells, and additionally to perform sorcery spells. Remember that anyone practicing sorcery is working directly with evil sources and are terribly dangerous. It's not possible for an individual that practices sorcery to assist other individuals in breaking black magic sorcery. I do not practice black magic, cannot and will not at any time. My job is strictly working with positive religious energy. If you have any queries or any suggestions on how to make this web site higher to serve you, be at liberty to Contact me. Talal's Clientele From Around The World!